A new book on one of the most fascinating political figures of early 20th century Ireland. Ginnell was the man who started the last agrarian revolt in Ireland. He was both an MP in the British Parliament and a TD in the Irish Government. Ginnell was, without a doubt, the driving force behind the early success of Sinn Féin and was de Valera's confidant and 'right hand man'. The surname Ginnell represents a branch of the McGinley clan. Please note, when ordering two or more copies, contact eolas@mcginleyclan.org for the best shipping cost. Shipping by regiisterd post. A full history of the early years of the McGinley clan. The book starts off detailing the ancient ancestors of the clan going back to the 3rd century AD. The book stops at the end of the 1600's. Most of this book has never been published before. The McGinleys in the 1700's. Much of this book details our involvement in America during this century including McGinleys in the American War of Independence. The McGinley Clan brings to you a very special piece of artwork. "Pat the Cow" represents a typical Irish rural scene lovingly painted by the artist. We have Limited Edition prints available of this wonderful piece of art. 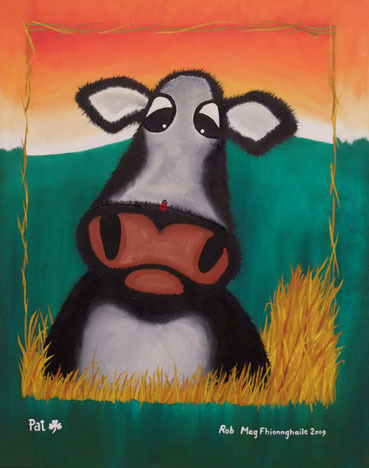 This humorous painting is guaranteed to bring a smile to every face. Notice the ladybird sitting on Pat's nose. Is Pat angry or simply bemused? This picture is sure to amuse adults and kids alike. Size approx. : 29cm x 36cm. Packaging: supplied rolled in a sturdy tube. The print is best bonded flat, then fixed to a matt/mount measuring about 16cm around (20cm at the bottom) with a black wood or dark brown frame. All proceeds will go to a local children's charity and towards the International McGinley Clan Reunion Fund. Special thanks to the artist for making his work available on this basis. High quality McGinley history scroll suitable for framing, carefully researched and designed. It gives a brief history of the McGinleys from the earliest times to the early 1600's. 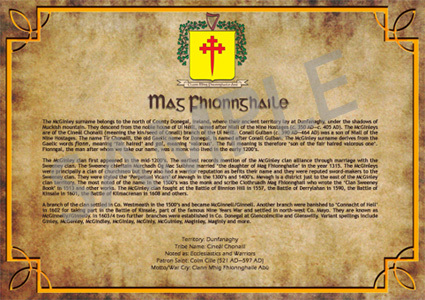 The scroll is tastefully designed and includes the only official McGinley clan Coat of Arms. The scroll is A4 size and supplied in a tube. Fridge magnet in acrylic frame.